Shortly after undergoing brain surgery at The Johns Hopkins Hospital, Baltimore, June 18, Cardinal William H. Keeler was cracking jokes with a family member, a sign the procedure went well, officials from the Archdiocese of Baltimore said. Deacon Rod Mortel, director of the Office of the Propagation of the Faith for the Archdiocese of Baltimore, visited the cardinal in his hospital room June 19. The surgery – which archdiocesan officials confirmed began around 12:30 p.m. and was completed around 2 p.m. – was performed by Dr. Benjamin Carson, neurosurgeon, to insert a tube into Cardinal Keeler’s brain and drain excess cerebrospinal fluid into his abdominal cavity. Head trauma the cardinal received during an October car accident in Italy is believed to be the cause of the accumulation of cerebrospinal fluid in the brain ventricles, otherwise known as hydrocephalus, archdiocesan spokesman Sean Caine said. Cardinal Keeler suffered a broken ankle during the accident, but continued to walk poorly long after the bone healed, which can be a symptom of hydrocephalus, Mr. Caine said. 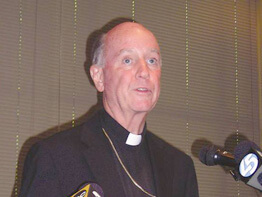 Cardinal Keeler will remain in the hospital for at least three days, at which time doctors will determine if he can return to his downtown Baltimore residence, or enter a rehabilitation program in a medical facility, Bishop Malooly said. The cardinal did inform the Vatican he would undergo surgery and the archdiocese will be run by Bishop Malooly, assisted by Bishop Mitchell T. Rozanski, eastern vicar, and Bishop Denis J. Madden, urban vicar, until he can return to work. It wasn’t known if the cardinal will be able to attend the June 23 ordination of four new priests at the Cathedral of Mary Our Queen, Homeland, but Bishop Malooly will preside over the ceremony. “Anything he can do to get there, he is going to do,” Bishop Malooly said, noting Cardinal Keeler was disappointed he would not be ordaining the four transitional deacons himself. Earlier in the day, as the cardinal underwent surgery, well-wishers and fellow Catholics prayed for the 76-year-old archbishop during a 12:10 p.m. Mass at the Basilica of the National Shrine of the Assumption of the Blessed Virgin Mary, Baltimore. Traditionally, 15 to 20 people attend the weekday Mass, but more than 60 attended the Monday service, along with members of the media. Several employees of the Catholic Center in Baltimore used their lunch hour to attend the Mass to pray for the cardinal’s speedy recovery. “We really wanted to come and show our support and to give him that extra prayer,” said Tracy Dernoga, who attended the Mass with her co-workers in fiscal services, Tricia Wienecke and Tyra Johnson. Cardinal Keeler is scheduled to have a check up in three weeks, to make sure the tube is draining fluids properly.